Part diary, part seasonal record, part profiles of remarkable people, Kate Humble's Thinking On My Feet shows the act of walking as so much more than a means of getting from A to B. As Elizabeth von Arnim said, "Walking is the perfect way of moving if you want to see into the life of things. It is the one way of freedom. If you go to a place on anything but your own two feet, you are taken there too fast, and miss a thousand delicate joys that were waiting for you by the wayside." So the author sets off (at a run!) at the beginning of the year and charts her journeys at home and abroad, whether celebrating the natural world, pounding city pavements, testing her endurance and independence, or using the clarity of mind that a good walk provides to solve problems or raise her mood. As she walks, whether alone, with her dogs, or with friends, Kate Humble observes her surroundings, reflects on "the joyous, almost hypnotic pleasure of walking", even when the route is tough, and finds in this simple form of exercise a grounding which sustains her on a daily basis. After a week - some of it difficult - on the Wye Valley Walk Kate writes, "I haven't switched off - I don't feel blank, nor does my mind feel empty, but it feels uncrowded, unburdened, open to suggestion, able to take in and absorb the small happenings of the day. To take pleasure from them." This state of awareness and connection becomes as vital as breathing. Kate, necessarily, walks in all weathers and all states of mind, but almost regardless of the conditions - external and internal - when she sets out, her walks provide a stretch, a shift, a levelling. Serenity comes from simply following the path. And then, while walking, serenity comes because all the hassles and dramas, all the things that gouge empty furrows in our lives and our bodies, become as if suspended ... Serenity is the immense sweetness of no longer expecting anything, just walking, just moving on. " "I just think, I'll start and we'll get somewhere." That's Kate Atkinson on the writing process on Desert Island Discs. I applaud her choice of luxury! There's a post on Transcription, Kate Atkinson's latest novel, here. Ryder Carroll's The Bullet Journal Method provided a few lines to ponder last week; now I've finished the book and decided to try out this "personal operating system" designed to "track your past, order your present, and plan your future". If you're not already familiar with the concept then the website gives the gist and includes a video tutorial to get you started, but if you're wondering about the method's distinguishing features, then I'd suggest its mission is key: it exists "to help us become mindful about how we spend our two most valuable resources in life: our time and our energy. [It] will help you accomplish more by working less. It helps you identify and focus on what is meaningful by stripping away what is meaningless [...] by weaving together productivity, mindfulness, and intentionality into a framework that is flexible, forgiving, and, most importantly, practical." The book goes into a lot of detail and examples, and it spends as long on the system's 'why' as on its 'how', but I found it both a thought-provoking read and a comprehensive explanation of an attractive way of keeping track, and keeping on track. For more of the background, you can watch a Waterstones interview with Ryder Carroll here and his TED Talk here. Although ours is a very doggy household (see also the writers' dogs) I must mention the British Library's exhibition Cats on the Page which opens tomorrow and coincides with the 80th anniversary of publication of T.S. Eliot's Old Possum's Book of Practical Cats. On show will be original illustrations by Judith Kerr, Quentin Blake, Beatrix Potter, and Axel Scheffler; there will be sound recordings, Lear doodles, a 16th. century pamphlet on witchcraft including a black cat 'familiar', and more. Judith Kerr herself will be there at a special event on 3rd. December when she will be in conversation with her art editor. Heywood Hill have just published their Christmas gift guide and you can have a virtual browse here. I have my eye on Kate Hubbard's Devices and Desires: Bess of Hardwick and the Building of Elizabethan England, The Gardens of Bunny Mellon by Linda Jane Holden and Roger Foley, Magnus Nilsson's The Nordic Baking Book (he's talking about it here), and Sebastian Faulks's Paris Echo. If you're looking for an extra-special present, I can recommend Heywood Hill's A Year in Books subscription service. I recently gave Mr. C. the P.G. Wodehouse version, and his words on opening last month's beautifully wrapped parcel were, "It goes from treat to treat!". I'm not sponsored by Slightly Foxed but they are a source of so many good things that I mention them often. Their November newsletter includes a delightful article by Ken Haigh which appeared in Issue no. 53; click here and scroll down to read The Book Cure. 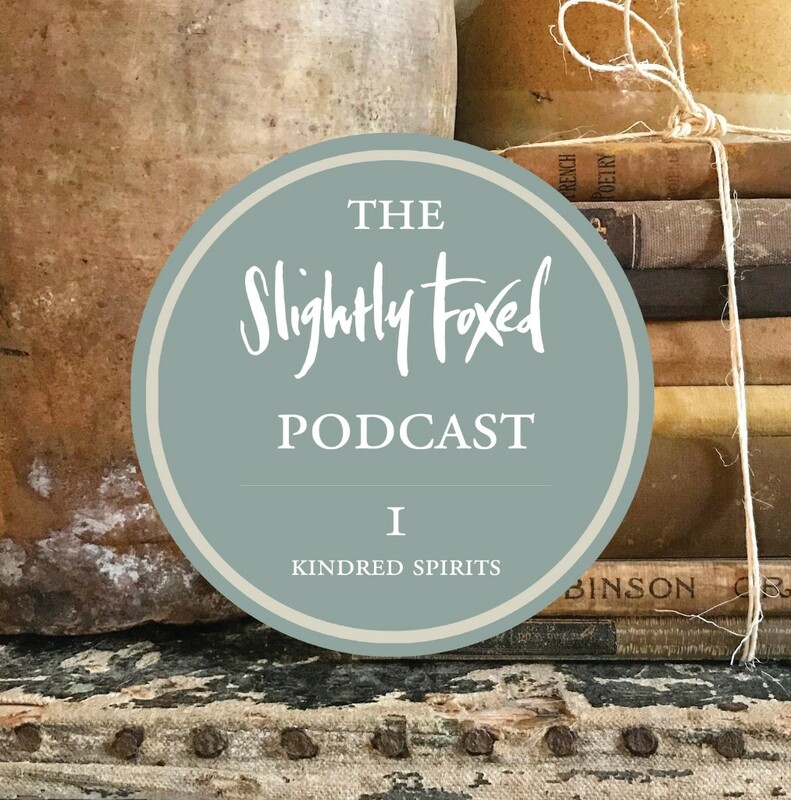 In case you haven't heard, Slightly Foxed have started a podcast. You'll find the first episode - every bit as charming as you'd expect - here. I'm in the market for more good bookish podcasts, so I'd be glad to hear of any you can recommend. "Notebooks are beholden to their authors. Their function is limited only by the imagination of their owner." "Your notebook greets you each morning with the pure, blank slate of an empty page. It serves as a small reminder that the day is as yet unwritten." "Your notebook evolves as you do. You might say that you co-iterate. It will conform to your ever-changing needs. The lovely side effect is that as the years pass, you're creating a record of your choices, and the ensuing experiences." Ryder Carroll, The Bullet Journal Method: Track your Past, Order your Present, Plan your Future. From Seneca comes the book's epigraph: "Let us postpone nothing. Let us balance life's account every day ... One who daily puts the finishing touch to his life is never in want of time."